“IT G MA Remix” f/ A$AP Ferg, Father, Dumbfoundead & Waka Flocka Flame. (2015). Complex: Keith Ape. Ellis, C. (2004). The ethnographic I. Walnut Creek, CA: AltaMira Press. Ellis, C., Adams, T. and Bochner, A. (2010). Autoethnography: An Overview. Forum Qualitative Sozialforschung / Forum: Qualitative Social Research, [online] 12(1). Available at: http://www.qualitative-research.net/index.php/fqs/article/view/1589/3095#footnote_1 [Accessed 30 Aug. 2016]. Sikes, P. (2013). Autoethnography. London: SAGE Publications. UNDERWATER REBELS FEAT. KEITH APE, Okasian, JayAllDay. (2015). Ken Rebel: Don Kevo. 잊지마 (It G Ma) (feat. JayAllDay, Loota, Okasian & Kohh). (2015). Hi-Lite Records: Keith Ape. Ellis, Adams and Bochner explain, writing autoethnography is writing something about ones own personal experience within another culture and use it to understand ones own cultural experience. It is how you write an autoethnographical account by describing the cultural experiences patterns. In my first post, I watched the documentary “State of Play” and experience a Korean culture. Thank you for the comment about the summary linking and aspects. And now, it is time to expand the ideas. In the beginning, I tried to express the feeling “excited” to the documentary. It is not normal as watching a documentary. Documentary is using pictures or interviews with people involved in real events to provide a factual report on a particular subject. The subject this time is gaming. I did not feel any distance away from the film, which I felt so close to the characters because I did have the same dream far back before. However, the excitement was the unknown mystery of gaming in Korea. When I heard Korea gaming, it popped out “Well, the title suits the film, from what I know about the gaming industry in Korea.” and I used the word “Honor”. Then, when I talked about Lee Jae Dong, one of the StarCraft players, I made a lot of assumption based on my own experience. For example, the gender assumption towards the fans he had and the economic incomes by playing only games. I also pointed out the difference between Australia and Korea in terms of being a professional gamer. So far, I do find my own response too personal. One of the reasons is about the comparison between Australia and Korea. I have not learnt or saw any big news or team from either Australia or Korea back then. The gaming type people play is different back then too. Maybe it is because the fact I was not in Australia in 2012 that I was still in Hong Kong. Now I think more critically and subjectively, but still the thought is following Asian culture rather than Australian culture, which proves that my response is based on my own Asian culture experience to analyze the film. The development of gaming in Australia became big since the Ninja Fruit mobile game. Australia is more focus on developing games instead of participating gaming events or competition in 2012. The research I can see my own analysis was cross over different years and tried to compare them together, and it is not really match the gaming industry in Korea. In Australia, I get in touch with online games and video games all the time. My daily routine is starting the game and play with friends. I do not have the feeling to be competitive or aggressive. But somehow when it comes to a system related to ranking, I get nervous every time I play. This observation was made last week and I was really hoping I could win without losing any games because of the rank. The observation provides the similar view of myself making assumption of those gamer in Korea, they were competing for the ranks in the games. The top they are, the better reputation they have. The reflection proves myself the cultural identity I have towards the experience I had while watching the film. I thought autoethnography was quite a bizarre concept when first presented to me at the beginning of the session. Being a process of writing about epiphanies which stem from experiences with and being within culture using autobiographic and ethnographic techniques, it seemingly went against my whole educated life in which we’re taught to remove personal connotations and approaches in the presentation of research. However, this waiver of uncertainty was surpassed when Ellis, Adams & Bochner clarified that it is not simply recounting personal experience, but rather using ‘methodological tools and research literature to analyze [said] experience’. I would not call myself knowledgeable on manga or anime. The most experience I’ve had is watching Spirited Away and dressing up as Sailor Moon one time (attempting to, anyway). In saying this, I was pretty excited to find out we were watching one of these films because I’ve always been quite fascinated by them. When I googled a fan made trailer for Akira (1998) the night before class, I was not prepared in the slightest for what was in store. I braced myself for what seemed like a grotesque, animated exploration of flesh and ego. (Medium) Appreciation for the skill of the artwork and graphics. I was so mesmerized by the light trails in the street racing scenes. It really was a visually stimulating 2-hour watch. (Plot) Wondered how kids so young had such impressive skills on a motorcycle and got to be involved in such rebellious, violent groups while still in school. (Character) Why Tetsuo refused to listen to people who obviously knew what was happening to him, but was instead completely blinded by rage and supremacy. (Plot) How did the espers come to be? Why did crashing into one of them trigger the powers Akira once had? (Culture) It was very interesting viewing Asian men in this grunge, gang subculture using such raw brutality when I’m so used to thinking of them as either businessmen, samurais or quirky k-pop characters. I get how small-minded that must sound, but it has just never crossed my mind due to my lack of exploration in this culture. Anyway. Looking forward to digging deeper in the next post! Today I am analyzing my own auto-ethnographic account of the South Korean documentary on professional gaming ‘State of Play‘. Autoethnography as defined by Ellis et al, 2011 refers to the act of observing a cultural experience and discussing how your own personal cultural experiences affect the way in which you experience this. In my initial autoethnographic account of ‘State of Play’, I was left dumbfounded at some of the situations exhibited in the documentary. This included the huge amount of fame given to professional gamers, these gamers then giving the majority of their ridiculously high earnings to their parents and the lack of equality exhibited in gender roles through South Korean society. After the initial shock of these differences wore off, I conducted research into South Korean traditions and values and found many answers to my questions of cultural difference. Now how does all this relate? The cultural values exhibited in Korean society and their values bring light to a lot of the things Lee Jae Dong did in the documentary ‘State of Play’ which confused me in my initial viewing. For example, I was thoroughly perplexed and mildly pissed off when Lee Jae Dong’s exclaimed that he gave all of his winnings to his father. Growing up in capitalist Australia my initial reaction was to accuse the father of stealing and question his use of emotional manipulation tactics. However, upon research and reflection, as Korean society places the family’s welfare above that of the individual’s, and Korean children are raised in debt of their parents by Confucian tradition, this act made sense. Despite the fact my upbringing still makes me view this as ridiculously unfair. One of the more extreme branches of these movements is ‘Megalia‘ who have spoken out against, misogyny in South Korea. Their website is a space which has been dubbed by Reddit user ‘SexyMcSexington’ (I know I’m sorry) as the ‘female Korean 4chan‘ which I find is an interesting perspective. The group have been surrounded in controversy as it attempted to ‘mirror’ the misogynistic comments male users would write about females. The group have been responsible for shutting down ‘hidden cams’ on the website Ticketmonster, which would film females in situations where they were unaware of being filmed. They lobbied for the removal of misogynistic banners from Hanshin University, donated over 6 million KRW to Aeranwon an NGO which helps single mothers, and most notably has stopped the sale of high concentrate hydrochloric acid which has been used as weapons in hate crimes against women by men. This was all done by lobbying and protesting by the group and are all significant measures which enable better safety and security of South Korean women. I love that there are feminists fighting for their voices and right to equality in South Korea as there was a very defined divide between genders throughout the documentary. The only females shown were the gamer’s mothers and sisters and then the fan girls whose only purpose seemed to be to worship and offer unyielding support for the players. Which I found very unsettling considering its 2016. I apologize for going off on a feminist tangent however I feel I didn’t delve enough into the issue in my original autoethnographic account. Through analysis of my original post, I have gained greater understanding of the Korean Culture and the state of society (pun intended) exhibited in the documentary ‘State of Play’ through research and reflection. Each week, progressively – my personal understanding revolving the autoethnographic process of research steadily improves, spurred by the routine experience of different texts from various Asian cultures. With this new found knowledge of experience based writing, it is now time for me to conduct an autoethnographic study of my own – and I couldn’t be more excited! The study will explore my experiences of researching, recounting and viewing the most ‘obscure’ but otherwise popular sports native to certain Asian cultures. These sports are ingrained into the social and cultural constructs of their respective Asian nations, and the observation from a different cultural lens will expose these wider traditional, political, and social understandings. My fascination of sport is deeply cemented into my personal interests and daily interaction– I am always happy to talk sport! – With rugby league being my favourite (see my YouTube channel here). However Australia is such a multi-cultural nation and it’s clear that most of our sporting dialect become lost in translation when speaking to someone from a different cultural background. This is an obvious reflection of a diverse social upbringing and a simple unfamiliarity to our sports. Without assuming anything, try saying ‘Bring back the biff’ to your Chinese roommate. While watching the Rio Olympics and with the autoethnographic task in the back of my mind, I deliberately avoided some of the more mainstream sports (Swimming, Athletics, Basketball) and focused my attention to some of the more ‘obscure’ sports making up this year’s games. I firstly sat through Trampolining – despite seeming like an activity you did in your backyard when you were 10 (trampoline debuted as an Olympic sport in 2000). This began an ongoing series of events consisting of Race-walking (pretty self-explanatory) and a modern pentathlon which incorporated fencing, swimming, shooting, equestrian and cross country running. This experience not only took me out of my comfort zone, but it opened up my eyes to a vast array of sporting cultures around the world. Origin: In 1880s Japan, during the Freedom and People’s Rights Movement, bo taoshi (literal translation: knocking-pole over) developed as an expression of rebellious energy aimed at toppling the Meiji oligarchy. Two teams are split into offensive and defensive groups, and two poles are placed at two ends of a large field. The attackers and defenders then scrum for control of the pole. Victory is attained when the attacking team brings down the pole to 30 degrees (relative to the ground). Shirts optional, no shoes allowed. Origin: Malacca, Malaysia, circa 15th century C.E. A sport native to South-East Asia that resembles soccer, volleyball and gymnastics all in one game. The Takraw ball is about the size of a 16” softball and usually made of rattan or hard plastic stems. Origin: Mongolia (North of China). Is the folk wrestling style of Mongols in Mongolia, Inner Mongolia and other regions where touching the ground with anything other than a foot loses the match. Involves moving enormous logs over difficult terrain completely by hand with the help of thickly braided ropes and then riding that log back down a dangerous hill. Origin: A traditional Indian sport in which a gymnast performs feats and poses in concert with a vertical wooden pole or rope. Access to the sporting videos will remain my most important obstacle. At the moment my most reliable resource for visual research is YouTube. Some of the various websites for these particular sports also provide videos and images – which I will utilize to my advantage. My method will require me to sit down and watch the gathered footage retrieved for each individual sport. I will be experiencing each sport individually and before I start each sport I will read through the rules to enhance my understanding beforehand. I will record and write down my experiences and draw knowledge from my own cultural norms in order to analyse the different traditional, political and social values. In summary, the exploration of sport (a topic I ooze passion for) in other cultures different from my own will no doubt enhance my understanding of the autoethnographic process of research. If the Olympics have room for more esoteric, even dubious events like trampolining, why shouldn’t practices like Mongolia’s bökh, India’s mallakhamb or Malaysia’s sepak takraw be given a shot at the world stage? It was only a few weeks ago that I attempted to expand my horizons and experience Korean gaming culture with a set of fresh eyes. This autoethnographic experience was enlightening, and brought my attention to the fact that I was ultimately an outsider when it came to eSports, gaming and Lee Jae Dong. Despite this, here I am, trying to make sense of my initial assumptions and interpretations of my State of Play experience (which you can read about here). As aforementioned, autoethnography as a methodology aims to “facilitate the understanding of a culture for insiders and outsiders”, drawing on “subjectivity, emotionality and the researcher’s influence on research” (Ellis, Adams and Bochner). Reflecting on one’s experience of a cultural phenomenon can be insightful and explorative. It not only highlights “dominant narratives” and “ways of thinking” about culture but seeks to understand such experiences on a larger cultural scale (Warren, 2009). In my first auto ethnographic account of State of Play, I made several cultural assumptions and addressed ‘dominant narratives’ I felt were essential in the documentary. Re-examining my initial interpretation, and by conducting a little more research, I have once again become a more culturally aware individual. Read on, and you can be too. After watching State of Play, I was admittedly astonished that gamers in Korea had such celebrity status and were afforded with privileges similar to those of professional sports players. Little did I know that gamers around the world, — not just in Korea, — earn millions when they put their skills to the test. 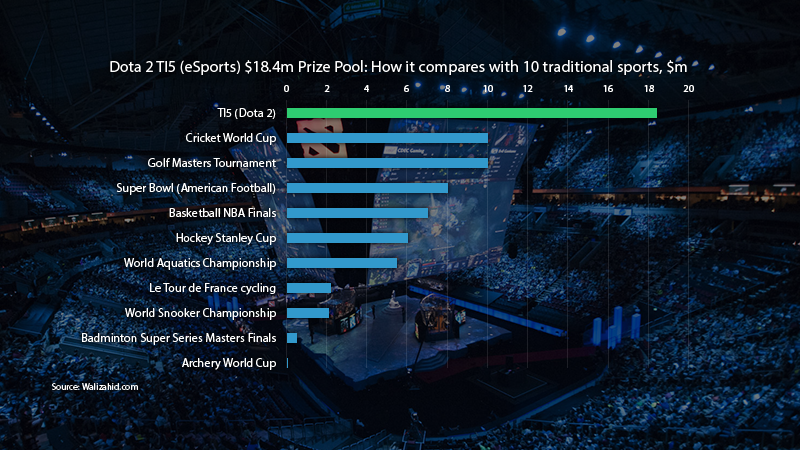 “DoTA has actually gone on to host the largest tournament prize pool, with nearly $11 million for their 2014 International. That’s a larger prize pool than the Masters Golf Tournament” (Aaron, 2015). The above graph highlights this. Furthermore, gaming tournaments attract global sponsors and intrigue audiences in the millions — eSports are now broadcast on networks like ESPN, making them accessible to all. Gamers make similar commitments and moreover share in the sacrifices that other professional sports players make to create a career. By reducing these individuals to “just gamers” in my first experience I failed to understand the deeper meaning behind gaming culture. After scrolling through more ‘research’, I became acutely aware that whilst there were no females battling for the tournament prize pool in State of Play, female gamers do exist. “According to the Entertainment Software Association (ESA), 44% of all gamers in the U.S. today are female” (Gaudiosi, 2015). Perhaps most notably, “one of the great things about eSports is it’s one arena where there is no difference between men and women; they’re both equal in the game” (Gaudiosi, 2015). Just because the representation of women in State of Play was skewed, that doesn’t mean that women are missing from the global gaming ‘narrative’. Another cultural assumption bites the dust. Autoethnography requires one to be self-reflexive and open in order to understand a cultural experience. By drawing on additional information from scholarly sources, media articles and social commentary my experience and understanding of Korean gaming culture has reached a new high. Adding layers of information onto my autoethnographic account of State of Play has shifted my perspective on eSports and the Korean gaming phenomenon dramatically. Ellis, C., Adams, T.E., and Bochner, A.P., 2011, ‘Autoethnography: An Overview’, Forum: Qualitative Social Research, 12:1. Warren, J.T., 2009, ‘Autoethnography’ in Encyclopaedia of Communication Theory, SAGE Publications, p.68-69. Last week in DIGC330 with Chris, we discussed assumptions, and epiphanies in relation to our text. We were asked to revisit the text we looked at, and analyse our assumptions in an autoethnographical way and come to some conclusions/epiphanies through personal research. One of the many points to autoethnography is the idea that there is no right or wrong way to look at a text, as it depends how we see it. But it is safe to say I was quick to judge the 1954 film Gojira. Although I don’t believe I was ‘wrong’, I used previous assumptions from cultural and social background context of the film to sway my first viewing.